Walk into Bardot Brasserie and you might start to feel like you’re in a Parisian café. The restaurant’s low lighting, tile flooring, dark woods and brass accents have a distinctively French feel. Eat the escargot, steak frites and other French favorites and you’ll definitely feel like you’re in the City of Light. Bardot Brasserie at Aria, which opens today, is James Beard Award-winning Chef Michael Mina’s tribute to traditional French brasserie fare. Hors d’oeuvres include charcuterie boards, cheese plates, roasted bone marrow and more. For entrees you’ll find mussels marinières, Parisian gnocchi and sautéed skate wing. If you’re on a date (and we definitely suggest you take a date here if you want to score some points), order one of the plates for two like lobster Thermidor or a lamb crown roast. The French know how to do dessert so be sure to try the chocolate macarons, crème caramel and apple tarte tatin. If you’re one of those people who’s maybe not so into escargot, at least come here for a drink. 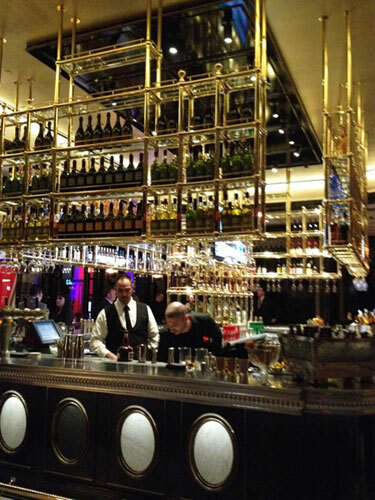 The 360-degree bar at Bardot is a stunning centerpiece of the restaurant with beautiful brass shelving. Libations include fine French wines and Champagnes, imported and unique craft beers, vintage cognacs dating back to the 1800s and Las Vegas’ largest collection of Chartreuse (a liqueur aged with 130 herbs, plants and flowers). We love the sophisticated Parisian-inspired cocktails like the Voltaire, made with cider, Grey Goose L’orange vodka, housemade ginger syrup and baked apple bitters. And Storming the Bastille sounds pretty amazing too, with Bastille whisky, Maurin sweet vermouth and Bitterman coffee bitters. Bardot serves dinner daily from 5 p.m. to 10:30 p.m. with brunch offered on Saturday and Sunday between 10 a.m. and 2:30 p.m.